The Civic sedans didn't come with a sway bar from the factory. There's not even a place to mount it. We got the rear swaybar from the Integra when we swapped out the rear brakes and lower control arms. It's a paltry .5" in diameter. It was suggested that we need something like 1000 lb/in rate at the wheel. The stock Integra bar is closer to 15 lb/in. Fortunately the front sway bar from a Jeep TJ is about the same length as the Integra bar. It's also 1-1/8" in diameter. 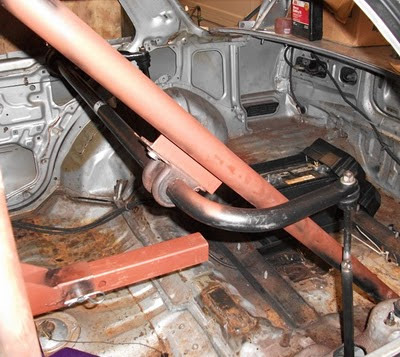 Since torsional stiffness is related to diameter^4, the Jeep bar will be over 25 times stiffer than the Integra bar. Of course it's lever arm is also longer, so that reduces the rate by a square factor. We couldn't find a place to make it fit underneath the car, so we mounted the bar to the cage and used some tubing to connect it to the wheel. I think we ended up with the right balance between hoopty and clever for LeMons.